David, a native of Great Falls, Montana, graduated from Charles M. Russell High School prior to attending the University of Montana. He played noseguard for the Grizzlies as he put himself through college on a football scholarship. He earned a Bachelor degree with honors in Political Science with an emphasis in Business Administration. 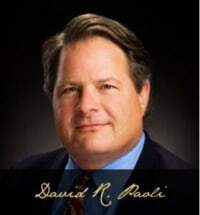 During law school, David was a member of the Board of Regents of the Montana University System. After graduating with honors in 1986 from the University of Montana School of Law, he was a law clerk to Judge Jack D. Shanstrom, United States District Court, District of Montana. While working for Judge Shanstrom, he served on the Montana Human Rights Commission. After practicing personal injury law in Billings for three years, David began his own plaintiffs' civil litigation practice in 1992. He moved his offices to Missoula in 1993. He has represented individuals and small businesses from across the state of Montana in cases involving FELA, personal injuries, insurance bad faith, products liability (automobile manufacturer, medical devices, prescription drugs, etc. ), medical negligence, and bank bad faith. David was elected to the Montana Trial Lawyers Association (MTLA) Board of Directors in 1990 and served as MTLA president in 1999-2000. He was the 1992 Recipient of the MTLA Public Service Award. He is a sustaining member of both the MTLA and the Association of Trial Lawyers of America (ATLA). He is listed in The Best Lawyers in America and is Designated Legal Counsel to the United Transportation Union. In 2011 the Montana Trial Lawyers Association recognized him as Trial Lawyer of the Year. David has previously served as Chairman of the United States Magistrate Judge Selection Committee and as a Lawyer Representative to the Ninth Circuit Court of Appeals. Most recently he taught the products liability class at the Law School. He is a member of Rotary International and serves on the National Advisory Board for Grizzly Athletics. David and his wife, Monica, have two children, Isabella ("Bella") and Angelo Nino ("Nino"). When his work and family obligations permit, he enjoys spending time fly fishing Montana's great rivers and streams, bird hunting, and cooking gourmet Italian meals to raise money for his favorite charities. We started this trial at the Holiday Inn ballroom. And now we're here in this glorious courtroom. And the point that I want to make is, it doesn't matter the venue where justice is finally determined. It's you folks that determine justice. During this trial I have had the occasion to look at the mural behind the judge. Freedom, equality and justice. And those virtues, I know, are very dear to all of us. And I don't know if the metaphor will be apt because I don't want to demean those great virtues. But it's as if they are a three-legged stool. And without one the stool doesn't stand. But now, we're at justice. We can't be free unless we're equal. We can't have justice unless we're free. They're interdependent. But now we're here with justice. And I have heard a lot, and we all have, about preserving our freedom. With justice, I have now learned you have to fight for it. Justice needs to be fought for. The truth needs to be fought for. The truth does not require an explanation. The truth does not require an expert from Boston. The truth is not equivocal. The truth is not misunderstood. The truth does not need to be rehearsed. And the truth cannot be sought nor discovered without the facts.